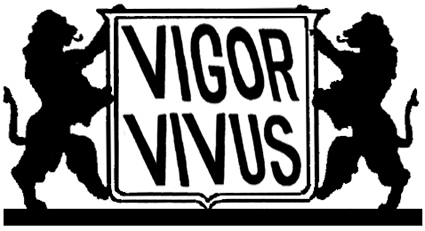 That's a beautiful emblem for Vigor Vivus; it looks like something you might see on a shirt tag. My own line of clothing. Two pipe-smoking lions advocating for the abundance of life. And they've certainly got the lift in their step for the spirit of it. Simply as a specimen of signage, it's a beautiful thing. You've got the old world traditions -- the symmetry of two guardian animals -- along with the straight baseline so typical of more modern designs. And as for the words featured, "Vigor Vivus," that's timeless, with a hint of immortality. Really, who wouldn't gather around eternal life ... the attitude of continuous, good, fulfilled life lived absolutely to the limit? I'd like to thank the nameless designers of this basic emblem -- this shield -- for it's not actually something I came up with. It's from the past, from at least 60 years ago, and perhaps, I don't know, at that time was already being copied from some old, proud family coat of arms. Isn't that the way coats of arms normally go? Lots of animals facing one another, pipes or no pipes? As for the words "Vigor Vivus," I'm afraid you have me to credit for that. My mission in the world, were it not for the fact that I'm not ready to go, would be over with the naming of the spirit of life. It's very exhilarating for me, yet also something humbling, to think that "Vigor Vivus" was not yet named, although of course it has been the spirit of seers, mystics, gurus, and saviors since the dawn of time, sometime after Adam. They have lived the good life -- overcoming Rigor Mortis, seeing and understanding death, but living in such a way that they could mentally and spiritually soar above it. This is a fab-tas-tacular emblem -- an unremitting shield -- and one I'm glad I stumbled on to. The spirit of Vigor Vivus is very proud. Very, very proud! Get into the spirit of Vigor Vivus yourself, turning from Rigor Mortis. My Vigor Vivus posts can be found here.